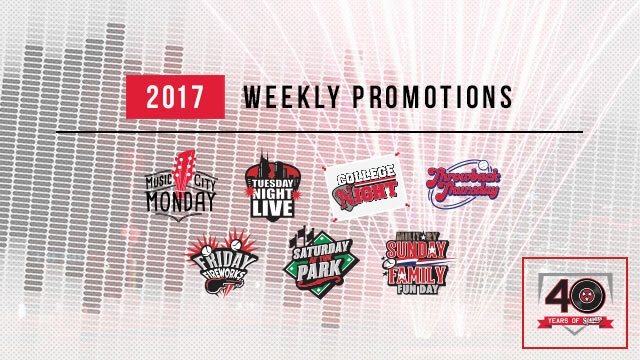 The Nashville Sounds Baseball Club has announced its weekly promotions for the 2017 season. The 71-game home schedule at First Tennessee Park includes giveaways, fireworks shows, ticket discounts, musical guests, theme nights, special jerseys, military appreciation and family days. The Sounds' home opener is scheduled for Tuesday, April 11 when they host the Oklahoma City Dodgers at 6:35 p.m. at First Tennessee Park. Music City Mondays and Kroger Plus Mondays (11 Occurrences): Every Monday, the Sounds wear their black 'Music City' jerseys and celebrate 40 years as Nashville's first professional sports team with special giveaways featuring current and past players. Additionally, the Sounds and Kroger have teamed to offer fans the opportunity to purchase a "Family 4-Pack" which includes 4 Select section tickets, 4 hot dogs and 4 fountain sodas for just $44 when they show their Kroger Plus card at the Sounds Box Office. The "Family 4-Pack" is available for advanced purchase only - subject to availability. Tuesday Night Live (11): Live from Music City, it's Tuesday Night Live presented by The Tennessean. Enjoy special ballpark guest entertainers and fun theme nights at First Tennessee Park. Wednesday College Nights (6): Every Wednesday is College Night presented by First Tennessee. Local universities take over the ballpark and fans enjoy a special hat giveaway of the featured university. Additionally, all seniors (60 and older) receive discounted Corner or Select tickets - subject to availability. Throwback Thursdays (9): Go retro every Thursday as the Sounds wear their 1978 throwback uniforms to commemorate the team's original uniform style. Fans can purchase Coca-Cola fountain soda and Budweiser products at a discounted rate. FOX 17 Friday Fireworks (10): We light up the Nashville sky every Friday night with FOX17 Fireworks presented by Koorsen Fire & Security. Saturdays at the Park (12): First Tennessee Park is the place to be on a Saturday night in Nashville. Enjoy the roar of the crowd and the numerous entertainment options of The Band Box located in right field. Military Sundays and Family Fun Days (12): Bring the family to celebrate Military Sundays presented by Piedmont Natural Gas and Tennessee 811 as the Sounds extend their military appreciation with special military green jerseys and discounted Corner or General Admission tickets for active and veteran men, women and families - subject to availability. In addition, fans can enjoy a pre-game autograph session with select Sounds players and kids 12 and under run the bases post-game, presented by First Tennessee. A full promotions schedule will be announced in late February.